Blogging Identity – Anonymous or Public? I’ve been thinking a lot recently about blogging identity, and questioning whether I made the right decision to blog publicly rather than anonymously. I didn’t give it much thought when I started my blog, I’m not sure that I was even aware that there was such a thing as anonymous blogging. From the word go I put myself and my family out there for all to see. Names, pictures, personal (ish) information, it’s all there. I was happy enough with that. I didn’t really stop to think about the implications of sharing my family with the world. Blogging is a funny old thing. I spend most nights sitting at my laptop, carefully constructing posts. When I hit publish a range of thoughts flash through my head… does the post make sense, will anyone read it. While one of my main reasons for starting a blog is to document the kids lives so they can read it in many years and see how much mummy loved them, that is not my only reason, or I think I would have just made a scrap book for them. When I hit publish a little part of me is hoping that someone will read my writing and enjoy it. The funny thing is though, the first time someone I know told me they loved my blog I felt a bit taken aback. Embarrassed even…. It’s such a strange feeling, to know that actual real people are reading what you are writing. And then things get awkward… how do your pour your heart on to the page knowing that someone you know may be reading. It was difficult at first, because I rarely share my personal feelings with anyone, never mind someone I hardly know. But then, if you are comfortable to share things with complete strangers on the web, why not people you know? My main worry is my children… what happens if someone from the kids school reads my blog and use it to make fun of my them. Have I shared too much personal stuff about Neil’s ASD? I wonder how the kids will feel in a few years time that I’ve shared things about them, essentially without their permission… Think about how you felt as a teenager when your mam brought out the photo album, well now it’s not just photos. The stories and memories I share now which I think are cute… will they be totally embarrassed by it? Or are they growing up in to a world where sharing your life online is so common that they won’t even care? But how do you blog anonymously, really? The only way to truly protect your families privacy would be to use no names, no pictures, only stories. But then, because I started my blog as a site all about my family and our adventures, no pictures wouldn’t really work. I know lots of people choose to change their children’s names, but I don’t understand this. Why is it ok to share personal photos, but not names? I think I made the right choice. While I do still worry about my children, if there ever comes a time when one of them tells me they don’t like it there is always a delete button. And although I do still sometimes get a little embarrassed, it is nice to know that my boss enjoys my writing, or that another mum has watched my Youtube reviews and found them helpful for her family. I’m proud of my blog, and I don’t want to hide it! And I sincerely hope that in 5 or 10 years time my children will read my blog, and look at our photos and feel proud of the little piece of the internet that mummy created for them…. only time will tell. How do you feel about this? What way did you decide to go? Would you go back and change your decision if you had the chance? I started off with blurred photos- but that really didn't work to help tell a story. I go by my first name only, and I call my partner MrLondonMum and my Son is Baby London. There are slip ups along the way but I want to try and keep some details private really for safety aspects. I worked in media previously and know the full extent of how people can become obsessed by what we would consider normal. And I wouldn't want to inflict that on my partner or son. But it's so so so so hard. Also I think using real names often means readers have a better connection which I think I lose out on. I definitely think pictures help to tell a story. I only go by my first name, and we all have quite common names so I don't think we stand out too much. I know what you mean about slip ups, in my first week I used initials only because I'd seen a lot of other bloggers doing that, and I kept forgetting and just writing the full name. I ended up going back and changing them all to full names! Myself I have gone public. I think when you are making the choice of anonymous or public, it really depends how personal you want your readers to feel. If you are writing from your heart it does take away a bit if there are no pictures or anything to personalize a post. I guess it depends on your comfort-ability? It's a difficult one and it definitely is a personal choice, and yes some people are more comfortable than others with putting themselves out there. I think I made the best decision for my blog but can understand why other people may choose to be 100% anonymous. Its a tricky one isn't it? And such a personal decision. I started blogging in secret and now my secret is out. Sometimes that feels a bit weird, as I too am a very private person and suddenly friends and family are reading my inner thoughts. Yes, it is such a personal decision. I'm not sure how I will be able to blog in the way I do once Gwenn is at school. If she objected to being a part of such a public space then I would have to respect that. Really, I don't blog that much about her; it's more about my relationship with her. I do over share I think but you need to use your true voice otherwise people won't connect. I've always blogged with my identity public, although I take care only to share photos and other details outside of my family private unless people have said it's okay. I've never regretted it. It means I don't have to anonymise anything and although that means there are some details I do self-censor, it's the kind of stuff that I would rather keep in the family anyway, so to speak. And I never have to worry about blowing my cover (I'd be a terrible secret agent). I know exactly what you mean about being embarrassed when someone you know compliments you on something you've written. It's not too bad with friends, but a number of colleagues at work also read my blog and that can feel a bit odd sometimes. In fact, one of my closest colleagues discovered one of my other blogs completely by accident recently, which caused some amusement (tahnkfully not embarrassment) for both of us! I think with blogging, anonymously or publicly, you should only share something you would be comfortable sharing with people anyway, which means there should always be stuff that is kept within the family. Very interesting post! Did you go to Blogfest? This came up quite a bit there. I started blogging giving away very little. Over time I have relaxed a bit but don't give away too much…photos from behind or above of the kids, nothing too personal, no real names (apart from mine). But it is personal choice at the end of the day! It is definitely personal choice and there is certainly no right or wrong way to go about it. I didn't go to blogfest unfortunately, it's quite the trip from N.Ireland to London. Would have been interesting to discuss, it's such a personal thing, and everyone has different ideas so would have made for a good debate! I had a livejournal during my teenage years and used it partly as a blog and partly as a private journal. I totally understand that you do your blog for your mother. My mam lives in England and we live in N.Ireland so she only sees the kids once a year, and my blog is a great way for her to catch up on what we've been doing. Definitely, and I can see why you made the decision to blog anonymously in the first place. I'm sure you do love having your own blog! Sometimes I worry I may have given away too many details, but we don't use full names or anything. See I think being more open and honest on your blog can help open up a network of support, from both online people, and real life people if they happen to read your blog. It's great that through your blog you have become closer to your friends. I post a lot of photo's of my children, but I don't think I would ever post truly embarrassing photos of them, potty training or anything. We only use first names, so I hope my children would still be difficult to find on google, as our first names are quite generic. Very interesting post! 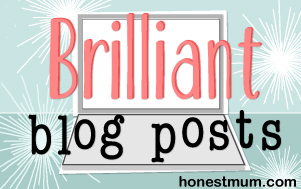 I kind of blog anonymously and hide behind a little road sign avi, but when I started blogging the only place I knew to share my posts was on my own personal Facebook! So of course people I know read it. Like you, I do get a little but surprised by that! I don't share recognisable pics of my kids because I would hate for their friends to stumble across the blog (my eldest is 13). Now my son is on FB I don't share all my most personal posts on my personal FB because I don't want him reading it!